Home > News > A career in the law: where do I start? …We’ve prepared a note on the route to get you there! A career in the law: where do I start? …We’ve prepared a note on the route to get you there! Lawyers tend to specialise in either criminal or civil work. Civil work includes divorce and children, writing wills and dealing with people’s assets after they’ve passed away (probate work), property transactions (buying and selling houses/business property), corporate and commercial work, advising employers and employees and much more. Within the umbrella term of ‘lawyer’ are many roles including barristers, solicitors, chartered legal executives and paralegals. Barristers tend to be those representing people at court, whereas solicitors, chartered legal executives and paralegals advise the clients, prepare legal documents, write letters and carry out the general day to day work required. Below is a diagram which (hopefully!) 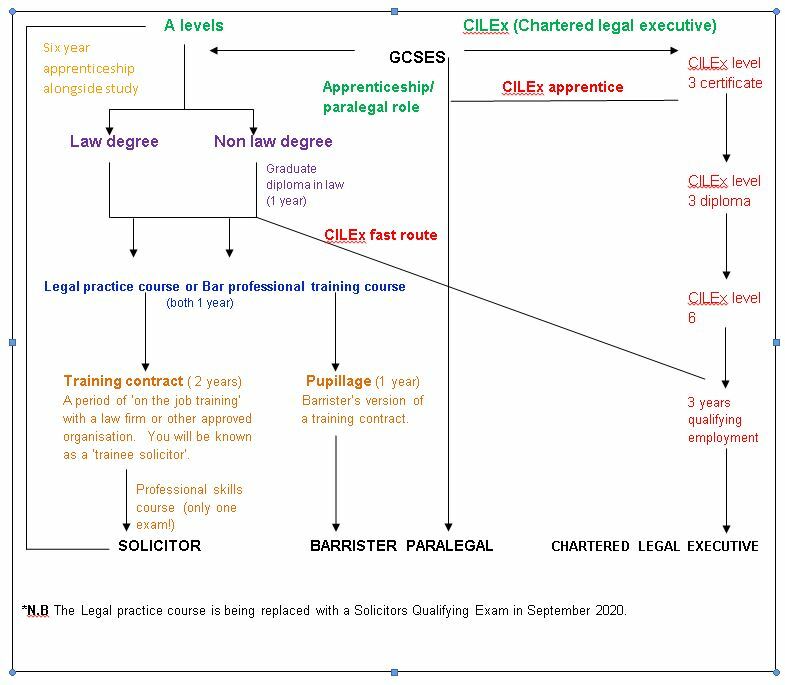 will make the different routes to a career in the law a bit clearer and the qualifications needed.